Pink Gator Cell Phone Case for Saddle - comes as pictured. This unique style cell phone holder attaches to your saddle, to keep your phone handy while riding! No more worring about your expensive phone falling out of your pockets or breaking! Your phone will stay snugly attached to your saddle, with no worries of it breaking, or getting lost! I use my own case while running barrels, and have never had to worry! *Velcro closure allows for any height of phone to fit snugly inside the case. 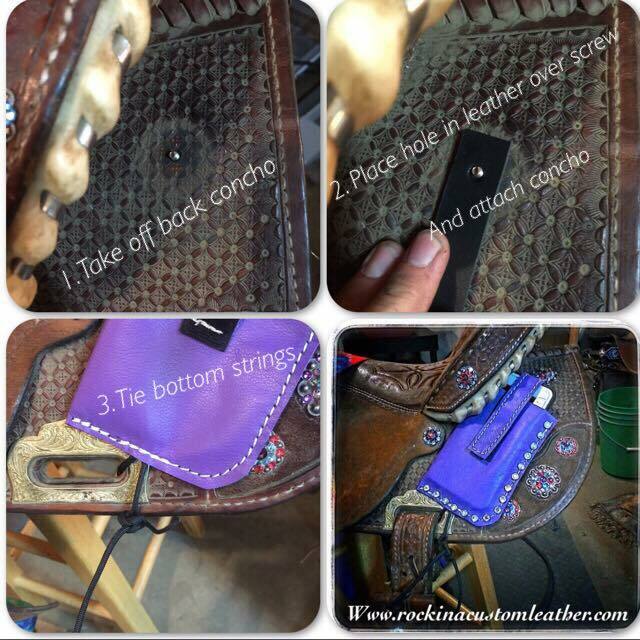 *The tie on the bottom allows for the case to stay flat on the saddle and not bounce around. *Case fits up to 3.25" Wide cell phones, can go wider by request.